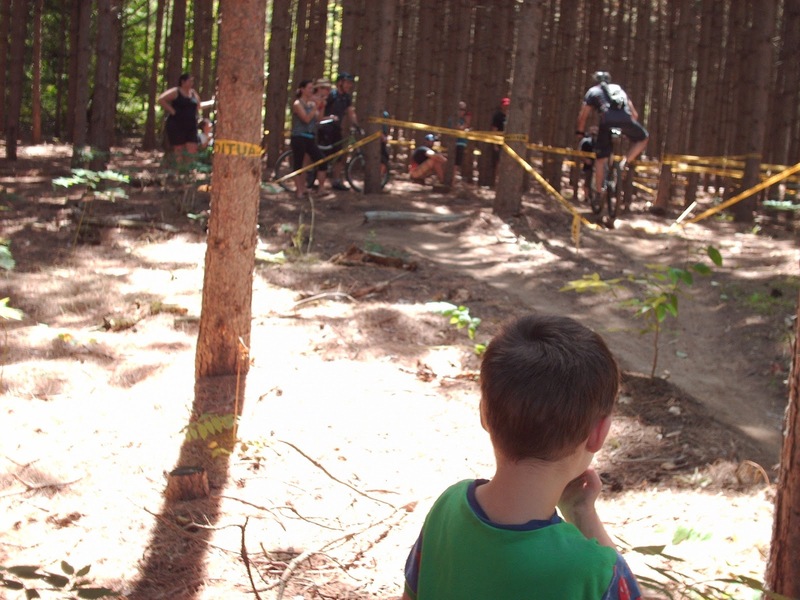 A few weeks ago, we piled into our vehicle and drove about 1.5 hours to a family-friendly mountain bike race. 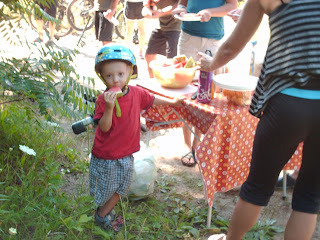 It got us out of the city (though it was still amazingly hot) and offered the kids new terrain to conquer on their bikes. Several races took place that day, but in the lull as one was finishing and before the next began, the kids could tear up and down the course to their heart's content. 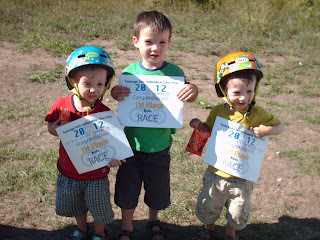 Designated kids' races were also on schedule, and multiple 1st place finishers proudly claimed the coveted prize of fruit chews. The guys additionally had a chance to watch the "big kids" race. A blanket under an umbrella with a picnic lunch, lots of snacks and lots and lots of water ensured the day ran smoothly. Our boys continue to pester me about when the next race is! 1. 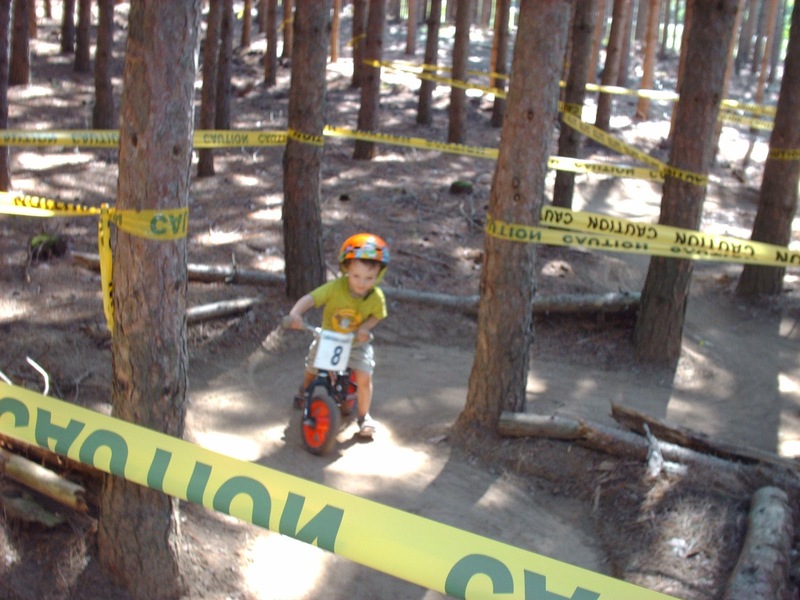 Always check with the race director before launching onto any course, so that you know it's safe to play on (you don't want to get shmucked, after all) and so that you won't be impeding other racers. 2. Adjust expectations. If this is the first time your child is trying an activity (e.g. he may ride a bike, but has he ridden it on unpaved and rough terrain?) steer him towards more manageable endeavours. 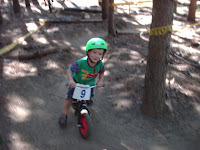 For example, our five-year-old experienced profound frustration when he couldn't ride the tightly twisting single track on his big bike, in contrast to his three-year-old brothers on their run bikes (i.e. bikes without pedals). 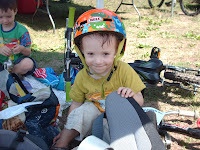 Solution: we helped him ride his big bike on the wider, less technical double track, and then he alternated with his brothers in railing through the single track chicanes on a run bike. Happiness! 3. Plan ahead to ensure you have a spot to take a break. 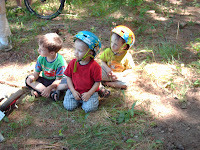 Although they literally spent hours on the race course, the boys were very happy at several junctures to get off the bikes, sit in the shade and snack. We have a beach umbrella with a corkscrew end and handles, so I can anchor it even in hard ground. 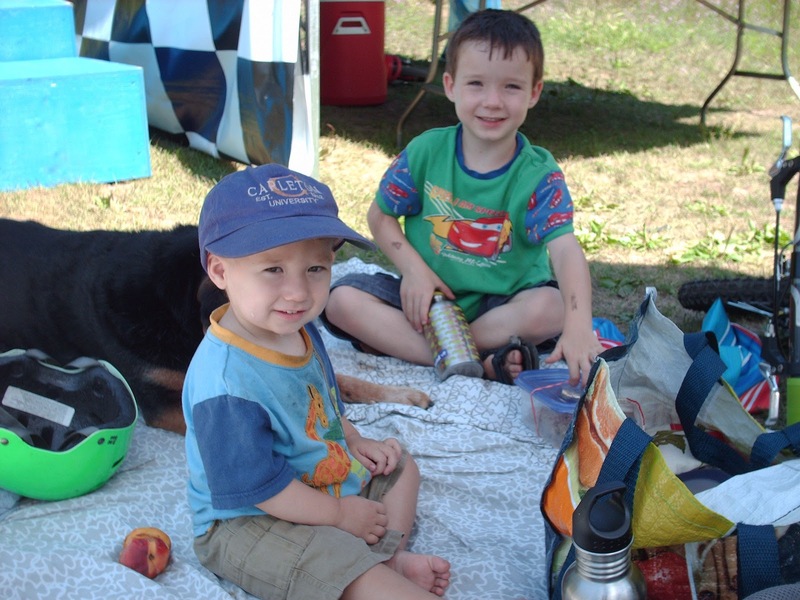 Another family we know use a pop-up tent as a "break room." 4. 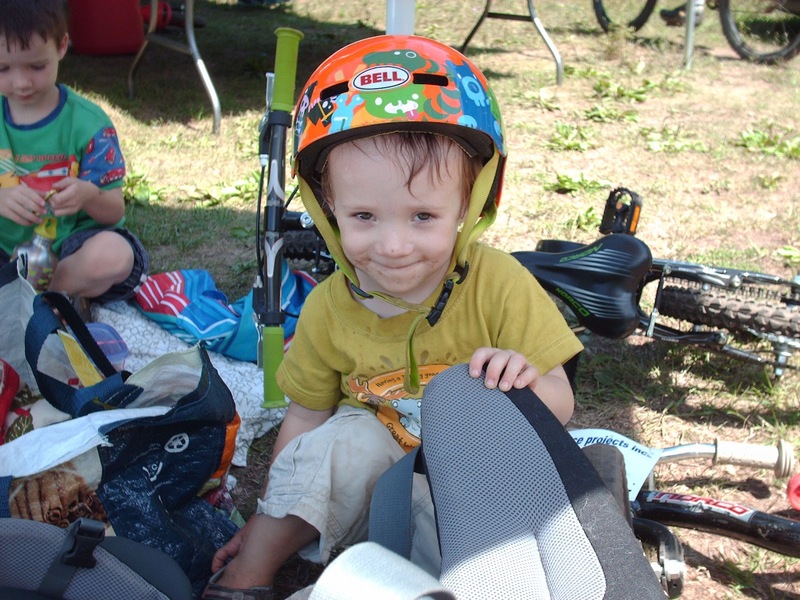 Naturally, be sure you'll have enough eyes available, especially if you're going with kids of different ages/abilities. I knew there would be others at the race I could count on to help out in a pinch. 5. Adjust your expectations about how the day will end. The usual bedtime routine may not be the best plan, and if your child is not routine-centred (some kids are) then deviating from the regular pattern is okay. For instance, I was sure that my guys would pass in the car out on the return journey, so I fed them and gave them a quick wipe down with wet cloths as we were leaving the race, which allowed me to forego the otherwise essential bath when we got home and pop them right into bed.